From healthy baby gums come healthy baby teeth. that's why you need to start providing good oral care for your children right from birth.Ratra's Dental is fully equipped with most sophisticated instruments & techniques to take care of your young one's dental health. some dental problems are best treated early, before it causes ill effects to the growth & development of the child. Our vast range of dental treatment options like dental sealants, child counsuling, dental programmes for right brushing & oral hygiene, dental fillings, pulpotomy, rct, space maintainers, habits breaking appliances, arch expanders, pendulum appliances, fluoride applications, anti cavity dental rinse for children prone to cavities, vast range of removable & fixed orthodontic appliance, braces, plates helps the growth of the kids in right direction. If parents see the permanent teeth of the child are not in line, harmony or crowded, kindly don't wait till 12years, consult now before its too late. with interceptive & preventive orthodontic techniques it can be treated now. 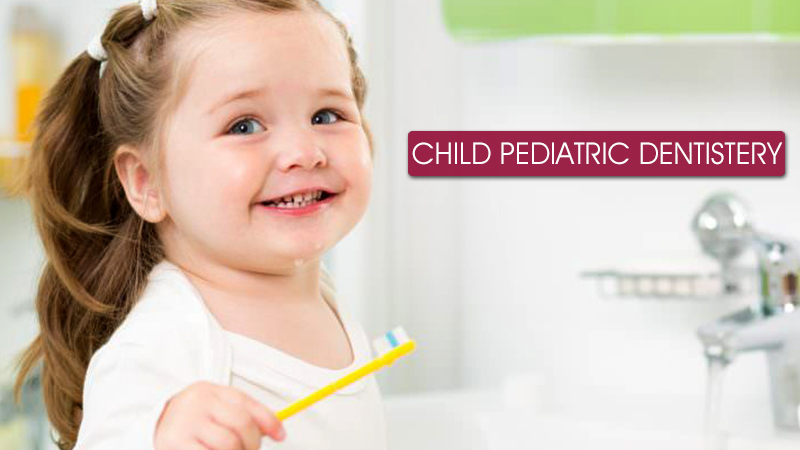 Our this section on pediatric dentistry will answer most of your questions. How can I care for my baby's gums? After each feeding, breast or bottle, gently wipe your baby's gums with a clean gauze pad. The discomfort of teeth coming into the mouth can cause your baby to become irritable. Signs of teething, in addition to fussiness, are drooling and the urge to mouth objects. A temperature of less than 100 degree is considered normal while teething. If your child has a fever while teething, call your physician. You can ease some of the discomfort by lightly rubbing your baby's gums with a clean finger or a wet gauze pad. A cool teething ring can also help soothe a baby´s tender gums. What should I do about thumb or pacifier sucking? The catchall term for the various oral sucking habits of children is non-nutritive sucking. This includes thumb or finger sucking and the use of pacifiers. Most contemporary pediatric health providers agree that these habits have important formative and nurturing functions and, at least for the first few years of life (up until about age 4), should be ignored. There is almost universal agreement that sucking should cease before permanent teeth begin to appear. The duration and intensity of sucking seems to be more important in determining dental changes. A critical issue with pacifiers is safety. A pacifier should be resistant to breakage, designed to prevent airway obstruction, kept clean, and never secured around your child´s neck. Consult your pediatrician on your child´s sucking habits. How exciting! That first tooth. As soon as the first teeth appear, it's time to start taking care of them on a daily basis to help ensure against cavities. Giving your baby regular oral cleanings after each meal instills good habits early in life. Baby's teeth begin forming even before birth. All 20 primary teeth - also called baby teeth - are present in a child's jawbones at birth. The lower two front teeth are typically the first to erupt, usually sometime around six months after birth. Do not be concerned if your baby is a little late. By age 3, all 20 primary teeth should be present..
One common way a baby can develop cavities is called "baby bottle tooth decay." It occurs when a child´s teeth are frequently exposed to sugary liquids for long periods. Among these are milk (including breast milk), formula, fruit juice and other sweetened liquids. Never use the feeding bottles as a pacifier. If you must give your baby a bottle at bedtime or naptime, make sure it contains plain water. Also, you should not give a baby a pacifier that has been dipped in honey or sugar. When to start brushing You should start cleaning your child's teeth as soon as they appear. A small, pea-size dab of fluoride toothpaste can be used after the child is old enough not to swallow it. Gently brush (see brushing method). One of the best ways to encourage brushing is to be a good role model. Many parents brush their own teeth while brushing their child´s, making brushing a fun time together. What´s the best way to brush? For infants, dentists and hygienists often recommend that parents use a simple, gentle, short, back and forth motion to brush and remove plaque. Once children are older, the following method is recommended. What about the right toothbrush? Children need to use a child's size toothbrush. These are designed specifically for the size and shape of a child´s mouth & hands. For example a large handle can help children control their toothbrush. Soft bristles with rounded end provide gentle cleaning of teeth & delicate gum tissue. Bright colors or fun patterns can help encourage brushing & make oral care fun. Which kind of toothpaste should I choose? Kids use what they like. One of the best ways to keep your child brushing is by having fluoride toothpaste on hand that is pleasing and easy to use. The taste can make brushing a more enjoyable experience, leading to more thorough brushing. Brushing twice a day results in increased fluoride applications to help strengthen tooth enamel and more opportunities to remove plaque. Flossing daily removes plaque and food particles between teeth and below the gum line. Teaching your children to floss is essential to their oral health. You will have to help your youngest children floss. You should start flossing your child's teeth even when they have only their primary teeth. To floss properly, wrap an 18-inch strand of floss around your middle fingers and hold a one-inch section tightly, then... Ease floss between teeth. Gently clean up and down several times while curving around teeth at the gum line. Always floss behind the last tooth. Unwind clean floss as you proceed. Be careful not to push floss into the gums. What role does nutrition play in healthy dental development? Good diet = healthier teeth. Healthy eating habits lead to healthy teeth. Many snacks that children eat lead to cavity formation. Choose nutritious snack for your child, such as vegetables, low-fat yogurt, fruits & low-fat cheese which are healthier & better for your children´s teeth. Why are enamel and fluoride important? The building blocks of healthy teeth. Enamel •Dentin •Pulp •Gum •Bone •Crown •Root Enamel, the hardest substance in the body, is the outermost layer of the tooth and protects the tooth from decay. Fluoride, a naturally-occurring substance, strengthens tooth enamel, making it more resistant to decay. Some common sources of fluoride are fluoridated drinking water, fluoride-containing toothpastes, and fluoride mouth rinses. Your dentist or pediatrician may recommend or prescribe additional fluoride treatments. Be sure to follow his/her instructions closely because too much fluoride can alter the appearance of your child’s teeth. TIME TO GO TO THE DENTIST. Children should visit the dentist by their first birthday. Ask friends and family and select a dentist in your area who likes children and takes care of them regularly. The first relationship your child has with a dentist can leave a lasting impression. How can I prepare my child for the first dental visit? You can make your child's first visit to the dentist enjoyable and positive. Tell your child in advance that someone will look at their teeth and clean them. Try showing them pictures of dentists or have fun role-playing, acting like you or your child are the dentist. Most dentists prefer that a parent be present for the examination of any child under the age of three. Some ask the parent to sit in the dental chair and hold the young patient in their lap during the first few examinations. It can also be helpful to take a your younger children along for an older sibling´s dental visit so that they can get accustomed to the of. ce and the people. As children get older, they are usually happy to be "grown up" and willing to sit in the chair alone while they send their parents back to the waiting room. At the first visit, your dentist will examine your child's mouth for early signs of decay and other problems. The dentist will tell you many of the things you'll need to know about helping your child grow up cavity free Make sure your child sees the dentist regularly. FAre X-rays of primary teeth necessary? Although primary teeth are in your child´s mouth for only a few years, it is very important that they are kept in the best health. Your dentist may want to take an x-ray to detect any unseen cavities that need to be . lled, or to make sure the adult teeth that are forming below the gum´s surface are in good position. Today, most cavities occur on the chewing surfaces of the back teeth. Dental sealants provide specific protection against that kind of cavity. A dental sealant is shaded plastic material that is painted directly into the grooves on the chewing surfaces of the tooth. The sealant acts as a barrier protecting enamel from plaque and acids. Braces and retainers are part of "orthodontics", a special discipline of dentistry concerned with aligning the teeth and jaws to improve your child´s smile and oral health. Through orthodontic treatment, problems like crooked or crowded teeth, overbites or underbites, incorrect jaw position, and disorders of the jaw joints are corrected. When is the right time for braces and how long do they have to stay on? Every child´s situation is different, but an ideal time for placement of braces is between 8 and 14 years of age while the head and mouth are still growing and teeth can be more easily straightened. The more complicated the spacing or biting problem and the older your child is, the longer the period of treatment, usually. Most kids can count on wearing full braces between 18 and 30 months, followed by the wearing of a retainer for at least a few months to up to two years. The retainer sets and aligns tissues surrounding straightened teeth. Will my child have to avoid any foods? Your child should avoid sweets, chips, and soda. Sugary and starchy foods generate acid and plaque that can cause tooth decay and promote gum disease. Sticky, chewy sweets like caramel can cause wire damage and loosen brackets. Hard crunchy snacks like popcorn, nuts, and hard candy can break braces. Also, you should cut foods like carrots or apples into smaller pieces. More don´ts: ice cube chewing, thumb sucking, excessive mouth breathing, lip biting, and your child pushing his/her tongue against the teeth. More important than ever Braces have tiny spaces where food particles and plaque get trapped. Your child should brush carefully twice a day with fluoride toothpaste and a soft-bristle toothbrush and rinse thoroughly. They should also floss between braces & under wires with the help of a floss thread. Teeth should be cleaned by a dental professional regularly to keep gums & teeth healthy. Insufficient cleaning while wearing braces can cause enamel staining around bracket or band. MORE THINGS PARENTS SHOULD KNOW. Here are answers to some of parents' other most frequently asked questions regarding their Children´s teeth & oral health. Can antibiotics stain my child's teeth? Yes. Some types of antibiotics can cause permanent discoloration of the teeth. Be sure to discuss this with your pediatrician or family practitioner when antibiotics are prescribed. Does mouth breathing affect the formation of teeth? If your child is a mouth breather, consult your dentist and pediatrician. Mouth breathing can be the result of an obstruction caused by enlarged tonsils or adenoids or from chronic nasal congestion. It can lead to dental abnormalities that may require professional correction such as braces. Should children wear mouth guards when playing sports? Considering more than 200,000 injuries to the mouth and jaw occur each year, dentists support the use of mouth guards in a variety of sports activities. Mouth guards are effective in moving soft tissue in the oral cavity away from the teeth, preventing laceration and bruising of the lips and cheeks, especially for children who wear braces. Clean with cold water or with an antiseptic mouth rinse. Store your mouth guard in a firm, perforated container. Why does my child have chronic bad breath? Bad breath can be a sign of inflamed or infected tonsils or adenoids, chronic nasal congestion, tooth decay, or gum problems. Consult with your dentist or pediatrician. What if my child has a tooth knocked out? Do not scrub or cleanse the tooth. Immediately place it in milk. If this is not available, wrap the tooth in a clean, wet paper towel or cloth and take it and your child to the dentist as quickly as possible. Many times, the tooth can be re implanted into the tooth socket, given this quick thinking attention.